Place the pastry on a large oven tray lined with non-stick baking paper. Using a paring knife, gently score a 2cm border around the edge of the pastry and prick the centre with a fork. Spread inside the border with a thin layer of cream cheese then sprinkle with two thirds of the parmesan. Refrigerate until needed. Place the potatoes, oil, salt and pepper in a medium bowl and toss to coat. To prepare the tart layer the entire right hand side, staying within the cream cheese rectangle,with 1 row of potato. Follow this with a row of mushroom and continue until the whole base of cream cheese is covered. 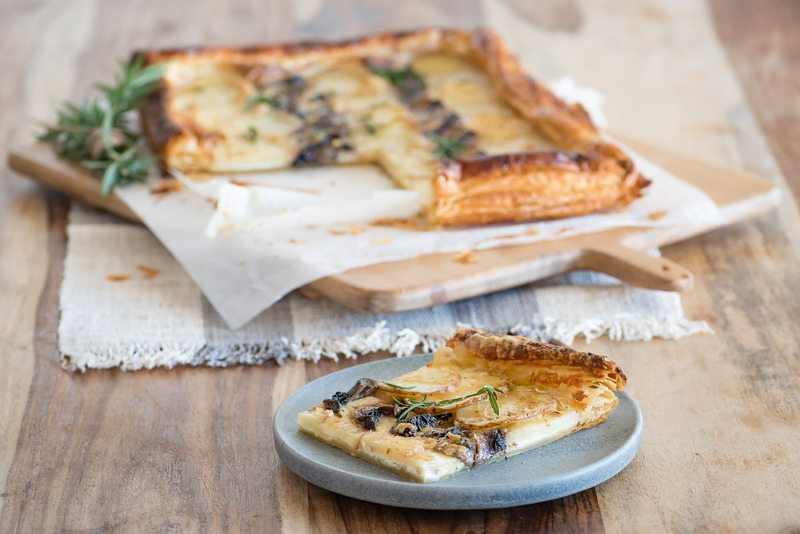 Dot the tart with the eight pieces of taleggio, sprinkle with remaining parmesan and cook for 20–30 minutes or until the base of the pastry is cooked and the potatoes are starting to crisp at the edges. Sprinkle with fresh rosemary to serve. TIP: The rosemary can be added to the tart for the last few minutes of cooking if you would like the flavour to be released a little more.